This was the very first bootleg I bought, so it keep a particular attraction to me, even if since I've collected plenty of others, and even found far better shows or sound quality. 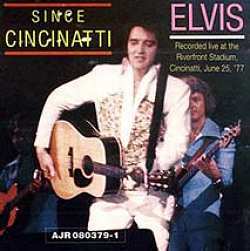 This is the second-to-last concert of Elvis' career, June 25th 1977, an audience recording. As it is mostly the case with the audience recordings, this make you feel like you're in the stadium, in the middle of a row. It won't give you an idea of what's happening on stage (forget about the details of drummer's work or anybody else) but it will give you a wonderful idea of the incredible interaction between the audience and Elvis. And it seems that June 25th was THE day! From the very beginning of the show to the end, you hear them roaring loud, screaming, clapping... who says that Elvis' late career was slow motioned? This audience is in frenzy just as long as he sings for them! The four first tracks of the CD give us some parts of the show of J.D. Sumner and the Sweet Inspirations. Nice addition, especially the Sweets, which I always found fantastic (listen to them on the CD My It's Been A Long Long Time, it's delightful!). A long 'CC Rider' opens the show, with a long introduction and loud screams through it. Elvis seems to need some minutes to wake up completely, but once he is, no doubt, he's in good shape. Before the usual 'I Got A Woman/Amen', he apologize for being late, and explain that he had some dental work to be done...hum...I'm not sure this is the real reason, but, anyway, every Elvis' fan know that he was in bad shape at that time, but that he always tried to entertain people as much as he could, and the best way possible. 'I Got A Woman/Amen' is done with commitments, and a very long "Amen", with the crowd clapping and singing along all the way. 'Love Me' is performed in its perfunctory way; you can imagine a lot of scarves being thrown away and Elvis receiving some presents. Tempo still a little bit slow with 'If You Love Me (Let Me Know)' but nice version anyway, very similar to the official one on the Moody Blue CD. It seems that Elvis really wants to give people something strong this evening, and, with "Mountain", he completely succeed. His voice is on top, and the TCB band at full blast. The smooth parts of the song are very touching, he's really into it, don't fool around or joke or anything, just singing with what is his trademark in his best moments: an absolutely stunning feeling. The next numbers are usual for the concerts in 1977, but all are performed well. Obviously, Elvis is having fun! Near the end of the performance, Elvis introduce daddy Vernon proudly and in an affectionate way...Ginger Alden and her family are also introduced, more or less the same way Elvis would do it the day after, in Indianapolis. Next is the BIG showstopper of the evening...the ladies in the audience go wild as he suggest to sing 'Unchained Melody' and to play the piano. The voice is majestic and impressive, nearly as good as the Ann Arbor version that is on the Moody Blue album. And, even if you can feel more than hear the loneliness and sense of sadness Elvis display in the song, the result is great, great, GREAT. Shiver guaranteed. As a response, Elvis get something which sound like a standing ovation from the crowd, a huge mix of loud clapping and screams. The King and the audience! Wow! Elvis close the show with a quick rendition of 'Hound Dog', and even this one get a good treatment, not the usual throwaway it is in the last three years. And finally the usual 'Can't Help Falling In Love". A lot of good points then. Terrific ambiance, Elvis in good mood and fair good voice, good show all in all. Anyway, if you don't have it, it won't be a loss of money nor time to get it. This CD resumes a lot of precious memories and feelings that most Elvis' fans cherished. © Arnaud Charreyre, Belgium, May 2004.